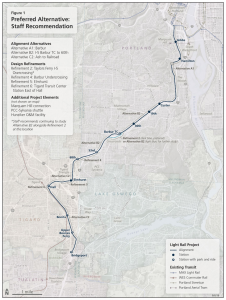 A proposed light rail line serving the bustling, and growing, Southwest Corridor is years away, but the route the trains would run through southwest Portland, Tigard and Tualatin is coming into focus. The TriMet Board of Directors approved a resolution on Wednesday, Sept. 26, 2018, recommending that the Metro Council adopt the Locally Preferred Alternative (LPA) for that route. The Southwest Corridor Light Rail Project will create improved connections to some of the region’s fastest growing communities and ease traffic congestion. It will link with the MAX Light Rail System in Downtown Portland, providing new access to opportunities throughout the metropolitan area. The corridor is home to more than 10 percent of the region’s population, with more than 70,000 new residents and 65,000 new jobs expected by 2035. 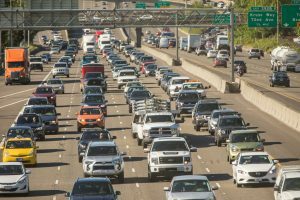 It struggles with major traffic congestion along I-5 and Barbur Boulevard – and that congestion is expected to double in the next 20 years. Light rail will speed up commutes, connect people with new jobs, get students to schools and training opportunities and improve safety for people walking, biking and driving. The expected $2.4-2.8 billion project will be funded with a number of sources, including a grant through the Federal Transit Administration’s competitive New Starts program. Download the Southwest Corridor route map.